Until last week, I hadn’t stopped to think about how often I’m advising authors about how to deal with the publishing business. I would imagine this is something that most of us in the industry find ourselves doing very frequently. There are, after all, a lot of aspiring authors in the world and when one’s a friend, or a friend of a friend, they ask. And you try to help them. Although we all know stories of self-published books that went on to have fabulous runs with a publisher (“50 Shades of Gray” being the obvious example), it seems that most agents think that most publishers see the previous publishing history as a challenge. If the book didn’t do well, they don’t attribute it to poor or non-existent marketing. And if it did well, they sometimes wonder if the audience has been exhausted. Obviously, there are both agents and editors who don’t think that way, but I was really surprised to learn that so many of them apparently do. 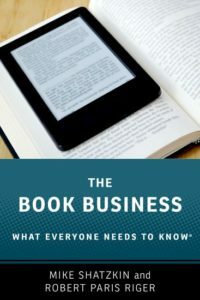 I would never attempt to advise an author on the techniques for self-publishing. That’s not what I know and there are many people, starting with our friend Jane Friedman (not the one from Open Road), who specialize in that (although she knows about finding agents and regular publishing too). But I have long had a formulation of how to recruit an agent which I passed along when asked. This assumes the aspiring author is starting from scratch: they have a manuscript completed or in development and they need to start knocking on agents’ doors. What I suggest — not rocket science but most writers don’t know about it — is using the databased information at Publishers Marketplace to find which agents to target. Of course, I do know dozens of agents personally. But rarely do I have a sense of what they are looking for, what kind of author would be suitable for them. I have one friend in particular who runs a large agency and for whom I have very high regard. So, often, if I know somebody to be a good and competent writer, I’ll send them to him. But that’s a sloppy answer. I find I have no good way personally to distinguish among the dozens of agents I know. That’s why I send people to the databases at PM. I tell my writer friends that if they narrow down their search and let me know whom they’re targeting, I’ll introduce them to any targets that are in my circle. But that’s been the extent of my help and that’s as far as I’d thought it through. Last week, I found myself offering advice to an extremely thoughtful author and her business-savvy husband. The author is Geraldine DeRuiter, who has an extraordinarily popular blog called The Everywhereist where she writes about travel (and lots of other things). We were introduced to her by her husband, Rand Fishkin, who is a longstanding thought leader about search and the creator and owner of Moz Analytics and Moz Research Tools, the experts on optimizing one’s presence through Google. My Logical Marketing partner, Pete McCarthy, has long been an admirer of Rand’s. Aside from being Moz’s inventor, he’s a prolific blogger whose blog shows him to be very generous about sharing his knowledge and perspective. Because we’re working on a business idea that we thought Rand could provide useful insight about, Pete reached out to him. Because Rand is a mensch, he gave Pete an hour call of great advice for nothing. During that, we learned that his wife, Geraldine, had a book she was trying to sell. All I knew was that it had something to do with travel and that she had a very big blog. I didn’t even know her name. But we knew she was looking for an agent and we wanted to at least minimally return the favor Rand had just done us. So I reached out to a very powerful travel publisher I know and asked for an agent suggestion. He gave me one name, an agent based in San Francisco and, as it happens, a person I know well. Since Rand and Geraldine are in Seattle, I thought that was worth passing along and I offered to make the introduction. That’s when I started to learn what even very smart people who know how to look have trouble finding out about how our business works. And I was forced to learn because Rand and Geraldine asked me about assumptions I had made that, it turns out, at the least required some explanation and perhaps required rethinking! First I told Rand I had an agent to send Geraldine to if she wanted to connect with him. Rand passed me to her. She said that being in Seattle, she was as comfortable with people in NY as with somebody in San Francisco. But, she added, she had already reached out to a number of agents in New York. Some had gotten back. Some hadn’t at all. So, first she wanted to know, is that typical? Do agents often just fail to respond? There are SO MANY agents that it is extremely hard to generalize accurately about them. Except that one generalization that is pretty universal is that dealing with writers they don’t (yet) represent is the weakest part of their game. It should be. What they really DO is work on behalf of the ones they’ve got and the follow-ups that are important to them are around deals in the making for projects they represent. I would assume nothing at all from non-response, not even any indication of competence. And yes, I think non-response may be the most common response. You only need one agent. There’s not a lot of point from your end or from theirs to auditioning an army of them. You should insist on feeling very comfortable with whomever it is you choose but I wouldn’t try to handle more than two or three at a time at most. If you have any positive indications from ones you’ve connected with before, obviously you should keep them in play until you’ve made a decision. But there should be no need to “chase” in this case. If you have agents who have already indicated they’d represent you, I’d stick to that group for now. You can check them out on Publishers Marketplace or ask me about them and I might know something. Rand came back questioning an assumption. I just have one follow-on question – are you saying/suggesting that the agent themselves doesn’t matter all that much in terms of their ability to help get a good publisher/good deal? That they’re (nearly or somewhat) interchangeable? And therefore, Geraldine shouldn’t worry too much about pedigree, background, experience, or agency, and more worry about her personal fit/comfort with the agent? Well, there are definitely levels of capability. They’re not all the same. I would definitely check an agent out on Publishers Marketplace and make sure they’ve made deals with the houses and editors you care about (and you’ll have your ideas about them from the deal database at PM too). You can ask me and I might be able tell you about their brand, or even about them personally. But, yes, in general I think having somebody you feel comfortable with is the best way to choose. Here’s the reality. There are five major houses. There are probably 500 editors to know in there. There are dozens of smaller houses. There are dozens of significant agencies in NY and London, and there are still indie agents that can do significant deals. So at the very top of the power end of the curve, you might not want the agent because your book wouldn’t be big enough to keep their sustained attention. You’re not “long tail” but you’re also likely not megabucks. You’re almost certainly in the middle. There are a LOT of agents that have enough access to be successful for you. The most important thing is that they care and that they’re prepared to be persistent. Personal chemistry is the best guarantee of that. By the way, I’ve actually done some agenting myself, including of six books I wrote, but also a bunch of others over the past five decades. But I’d never do it myself today. The industry has become more corporatized and structured. Even the editors I’m friends with who know me as a longtime publishing professional would know I’m a rookie agent. Publishers count on agents to be a reliable career guide to writers. They prefer real pros for many good reasons. One more point occurs to me that is responsive to your question. The same agent is not equally good for every book they might represent. Enthusiasm matters. Happening to have strong connections with three editors who would just love this particular book matters. Having belief that Geraldine can be groomed into a prolific author over time would matter. In other words, the agent who made the most deals for the most dollars last year might not make a better deal for Geraldine and this book than somebody who had done half as well. And all that uncertainty is why I’d go with a person with whom the relationship feels good. That makes tons of sense – thank you Mike. I only wish that information was more discoverable on the web – I’ve been doing plenty of searching the last few months as we’ve thought about this, and not come up with anything as credible or sensible as the reply you just sent. Goes to show that, for some queries, Google just isn’t good enough. Now, Rand Fishkin is the master of how to find things out through Google. And Geraldine DeRuiter has built an extraordinary following (being married to the King of Search can’t have hurt), writes like a dream, and is pursuing an agent for her book with seriousness of purpose and calculation. The fact that all of this could be so helpful to them was actually a bit of a surprise to me. Then again, maybe it isn’t all so surprising. This is yet another example of how granular publishing is: so many editors, so many agents, and then the numbers of them dwarfed by aspiring authors. In fact, they’re even dwarfed by the number of competent aspiring authors there are. Writing takes time. Reading takes time. Editing takes time. Developing a project takes time. Nobody gets paid until the reading takes place at a publishing house and a buying decision can be made. No wonder so many authors throw up their hands trying to break in and just publish themselves. Even with the best techniques and people with industry contacts to help make introductions, finding an agent is not easy for a writer. I checked in with some writers whom I’d advised in the past to see if they had any advice they wanted to give me! I got useful tidbits from two of them to add to this piece. One suggested a website called agentquery.com, which is, in effect, a directory of literary agents with an emphasis on which are looking for new clients. It might be a useful tool in conjunction with Publishers Marketplace. The other made the point that, these days, your agent is your primary editor and all writers need an editor. He said that your manuscript should come back from your agent heavily marked up and requiring a lot of additional work. His advice was to be wary of an agent that doesn’t start you off that way. This particular writer has had a long career as a magazine editor; he has the proper respect for the value of an independent editorial eye.